These contemporary breeches feel fresh and up to the minute with embellished jeans style pockets and eye catching diamanté detail. These contemporary breeches feel fresh and up to the minute with embellished jeans style pockets and eye catching diamanté detail. 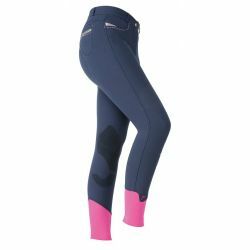 High performing Meryl® Sport fabric help these breeches feel and act like a second skin and Dri-Lex® leg cuffs provide a low bulk fit inside long boots. Belt loops, zip fly, 4 pockets and self-fabric contour seat.